burgers in DC | The High Life Suite | Fashion. Food. Love. What do you get when you mix old school hip hop, a nice bar in a good location and food and drinks?? A great new bar to enjoy! 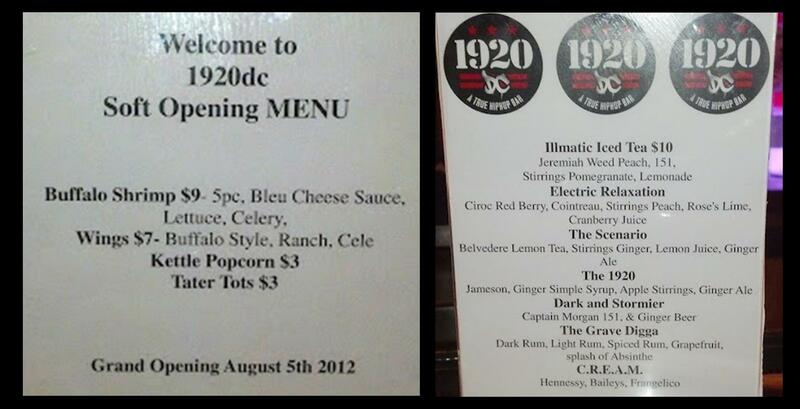 Dyanna and I recently checked out 1920dc. We absolutely loved it!! 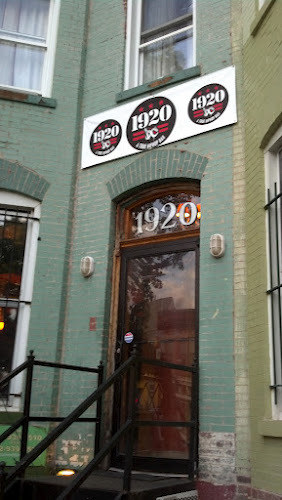 1920dc is located on 9th Street NW, just off of U Street. The vibe is nice and the patrons were friendly. With past episodes of Soul Train and old school hip hop playing, the environment is set up for fun. You may even break out with your favorite dance or two-step hearing one of your old favorite songs. This is currently a soft opening for 1920dc. Everything served is just a sample of what the actual menu will be. The grand opening date is set for August 5th. Of course, you know that Dyanna and I had to sample their offerings. We started off with their rum punch for $5. It was good. (A kind warning: The rum punch is strong…so be careful.) We also tried a drink called The Beautiful. Our great bartender, Jeremy, made it special for us. It was smooth and tasty and made of Hennessy, Grand Marnier, pineapple juice and a splash of OJ. 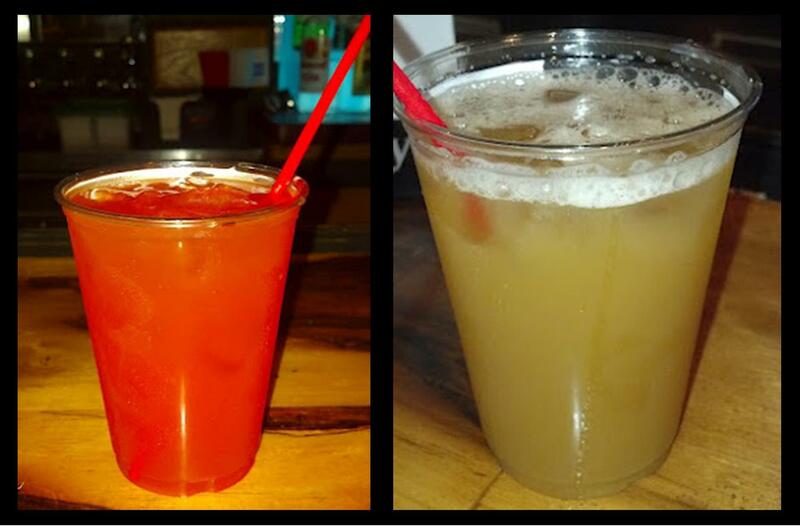 They are currently running happy hour specials of $5 Grand Marnier, Patron and rum punch. 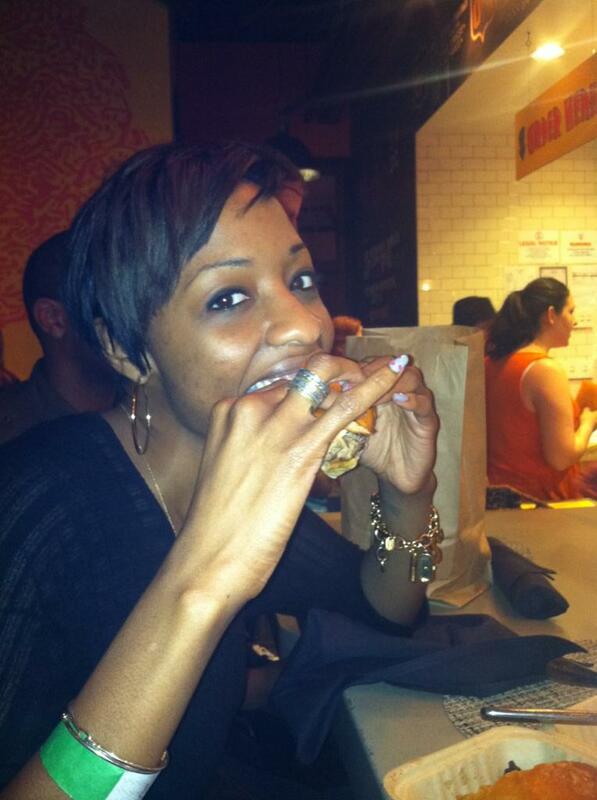 Food wise, Dyanna had the burger with a fried egg and cheddar cheese. She raved about how flavorful the burger was. She let me try a piece and I agree; it was delicious. 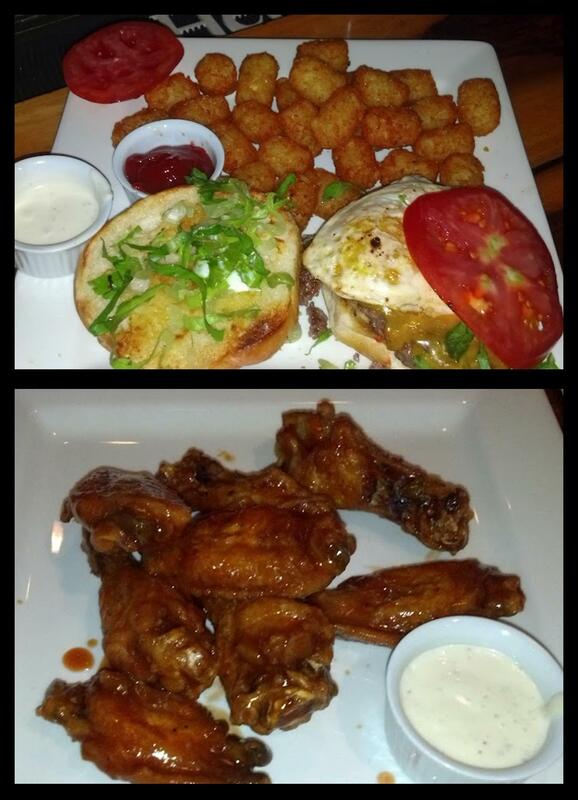 The burgers are served with tater tots, which are so yummy! I’m not sure what they do with them, but they taste great. I got an order of buffalo wings. Jeremy told me the sauce was similar to mambo sauce, so I was sold. The wings and the sauce were great. I will definitely be going back for the wings. Overall, The High Life definitely recommends you give 1920dc a visit. It’s a great bar with a good vibe, food and drinks. What more can you ask for? 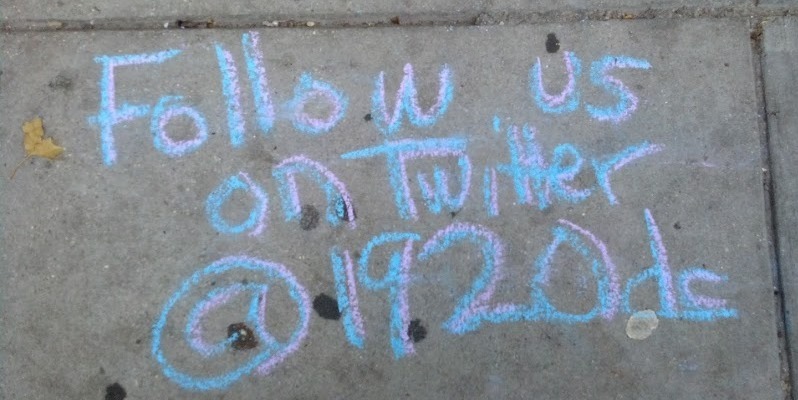 Let us know what about your experience at 1920dc. 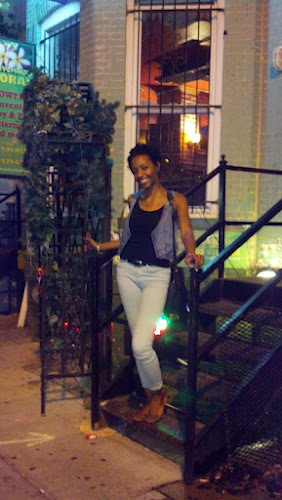 It’s late at night and you are out and about in DC, enjoying all the city has to offer. Suddenly you realize you’re hungry and jumbo slice pizza won’t do. You are craving a nice, juicy burger. So where do you go?? 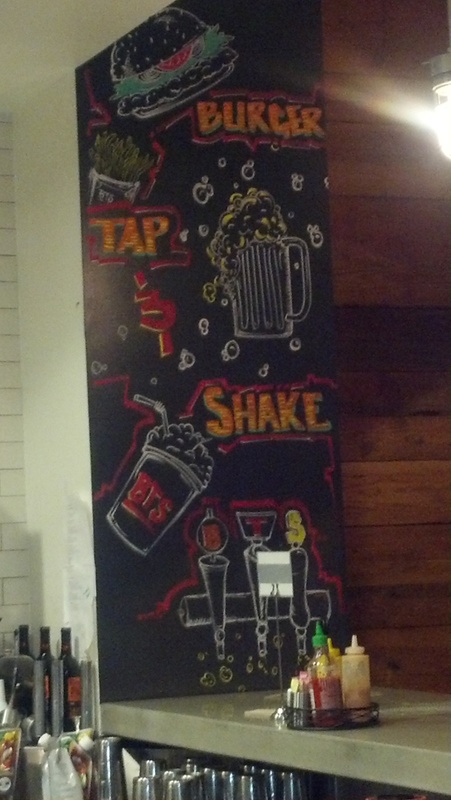 Burger Tap & Shake is your place. Dyanna and I went there recently and were very pleased with our selections. 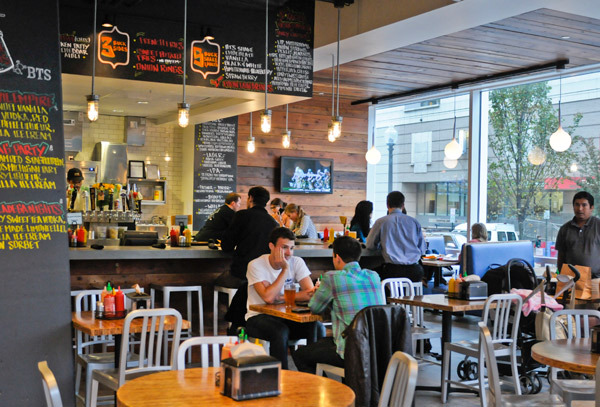 Burger Tap & Shake is located near George Washington University. It’s a burger joint that has signature burgers available or you can design your own. 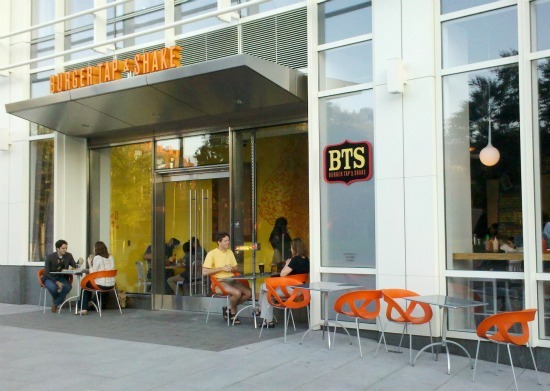 In addition to fries, onions and sweet potato fries (my favorite here), BTS also serves shakes and shaketails. What are shaketails you ask? Milkshakes with booze. So upon our visit, I had the Talledega Nights milkshake. It’s comprised of Firefly Sweet Tea vodka (another fave of mine), housemade limoncello, vanilla ice cream and lemon juice. It was delicious! The flavors complimented each other well and it was sooo tasty. I definitely recommend this milkshake if you like vanilla or lemon flavor. Dyanna had the Big Daddy Burger. 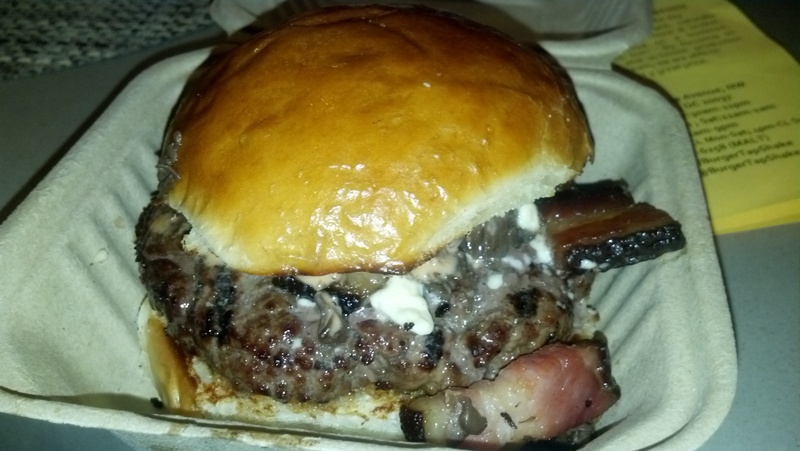 It comes with smoked benton bacon, buttermilk blue cheese, Lea & Perrins mushrooms, and AP sauce. She of course shared some with me and it was great! The burger was nice and juicy. The bread was soft and the perfect compliment to the burger. And of course, there was bacon!! Do you see how thick the bacon is?!?! It was definitely an added plus. Dyanna and I both highly recommend this burger. You won’t be disappointed. Overall, our experience at Burger Tap & Shake was a good one. You should definitely make it one of your late night eats spots. They have a lot of options to chose from, so you can make your perfect burger. Burger Tap & Shake is open until 11pm Monday – Thursday, 1am Friday & Saturday and 9pm on Sunday. Check out their full menu and other offerings here. 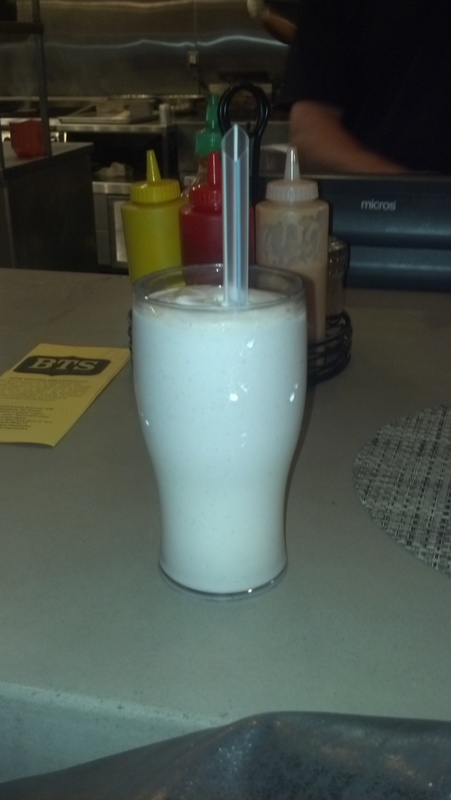 Have you been to Burger Tap & Shake before? How did you like it? I’m interested to know.